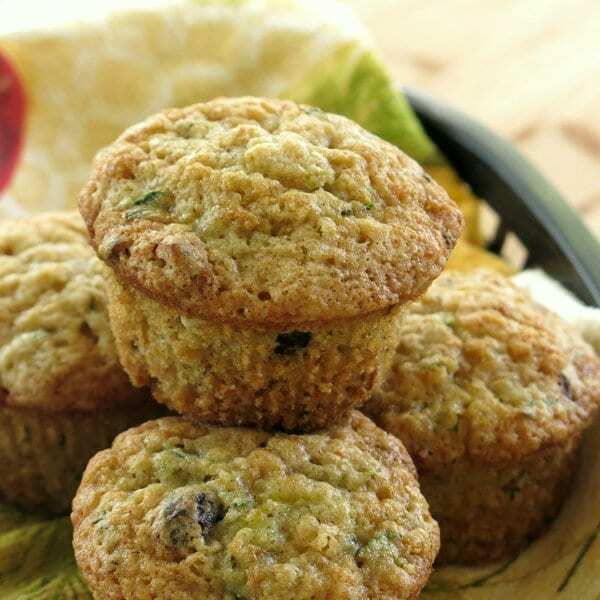 Zucchini muffins get a healthy makeover by swapping out oil for Greek yogurt, using a whole wheat flour blend and cutting back on the sugar. But, you won’t miss a thing in this tasty recipe. Do you have shreds leftover from making Zucchini Fritters with Feta or Zucchini Noodle Alfredo like me? 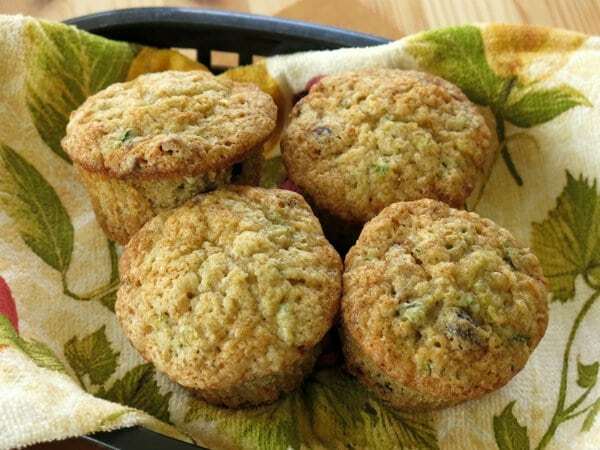 Put them to good use in this healthier version of zucchini muffins. Or, make Zucchini Blueberry Muffins or Chocolate Zucchini Muffins! 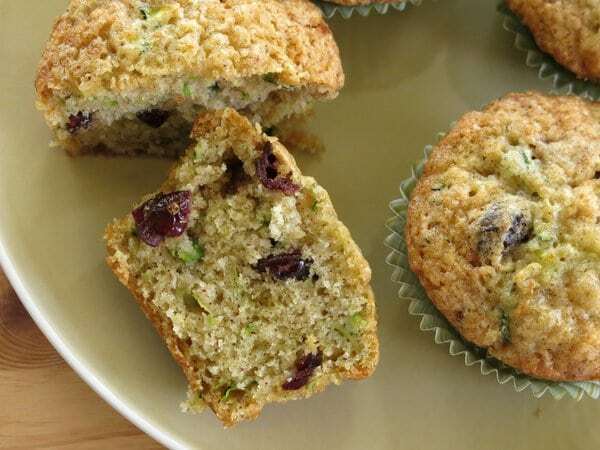 These are both variations of this popular muffin recipe! I looove these muffins and I just can’t stop at one. The only way to right this situation was to cut back on some calories and feel a little better about what goes in…with no sacrifice on taste. Otherwise, what’s the point? 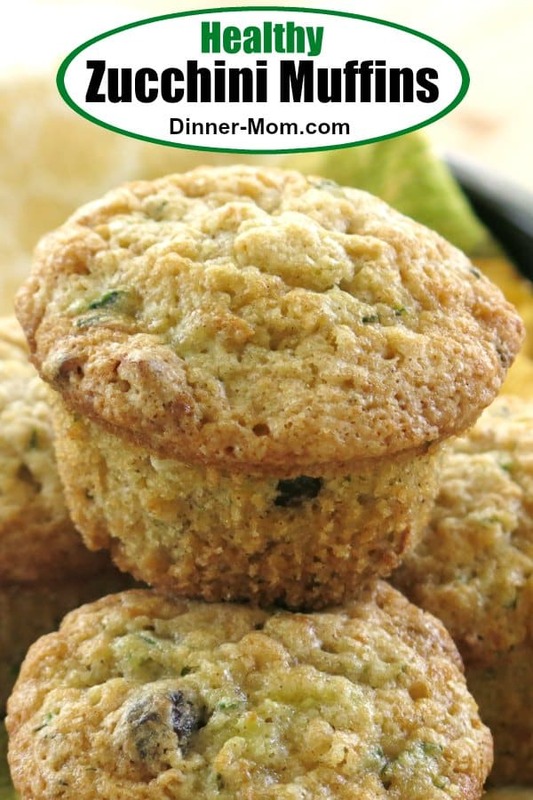 If it’s not going to taste like a sweet little muffin, then I might as well be enjoying one of the many other savory zucchini recipes that I love. Use Greek yogurt instead of canola oil. Use a blend of whole wheat and unbleached all purpose flour OR whole wheat pastry flour for the entire amount! Or swap out the sugar for date paste as we do in our Healthy Carrot Cake Muffins. These are the same swaps used for Whole Wheat Pumpkin Muffins and Healthy Banana Muffins and several other variations. The recipe is super easy to make. Mix up the dry ingredients, add the wet ingredients and stir in the shredded zucchini and cranberries or raisins. Walnuts are an option too. The batter is a little thick initially. It thins out as the wet zucchini is folded in. I pressed out some of the excess wetness from the zucchini shreds with a paper towel. 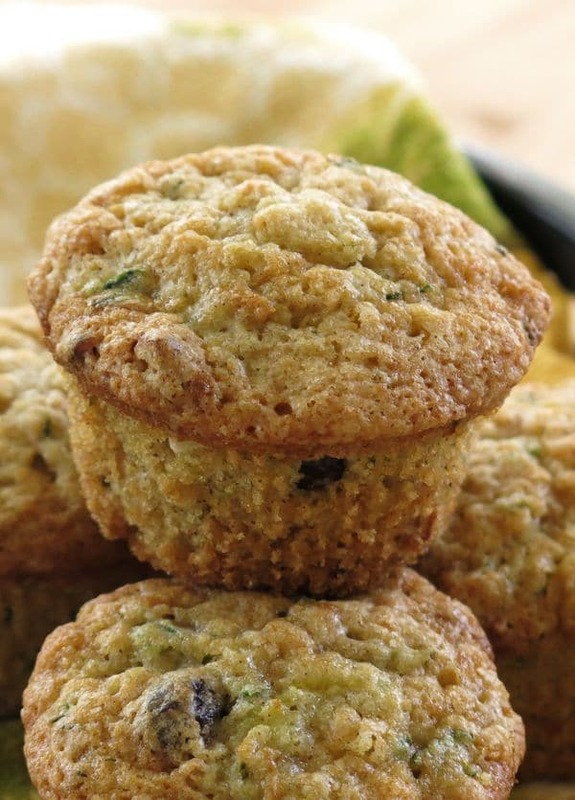 Even with this step, the zucchini adds plenty of moisture to these muffins. You get bursts of sweetness from the cranberries (or raisins.) Some of the little shreds of green will peek out…but, there’s no need to point this out if you have a particular eater. Serve these up with a glass of milk for breakfast or treat yourself to a healthy snack. Thank you very much…I’ll have two please! These tasty zucchini muffins got a makeover by swapping out some ingredients, like Greek yogurt for oil. You'd never know and now you can have two! Shred the zucchini using the large holes of a grater. Spread zucchini shreds out on a towel and top with another towel. Gently press down to remove excess liquid. Measure out 1 cup of shreds and set aside. Combine flours, sugar, baking powder, baking soda, salt and cinnamon in a bowl. Stir egg and yogurt into the dry mix. The batter will be stiff. Fold in cranberries or raisins. Bake for 20-25 minute or until the muffins are firm and lightly browned on the top. Note: 3/4 cup of whole wheat pastry flour can be used instead of the blend of unbleached flour and whole wheat flour. Do you know how many calories these have? Hi! I don’t have the nutrtional information for recipes. However, I believe a lot of people use My Fitness Pal or Calorie Count to calculate it. I love hiding vegetables in sweet treats. These look fantastic! Mmmm…baking with zucchini. Excited for it to be in season here! These look fabulous! I have zucchini growing the garden, now I have another idea with what to do with them! I love these! My sister in law grows zucchini in her garden and gives me some – I’ll be making these! Now all I have to do is wait for the zucchinis to harvest! Love finding new zucchini recipes. I always end up w/ so much zucchini from the garden. I love zucchini muffins- what a great way to make them healthier but still delicious! I really like adding dried cranberries to the mix. I bet that slight tang adds a lot of flavor. I love to use Greek yogurt when I’m baking! Love this muffin! Thanks! It’s a very versatile vege! Just a note: I made these last night, and had to add some almond milk to the mix; it was too dry and un-batter-like without it. They still came out great — will definitely make these again! The other thing to combat dry batter would be to skip the draining/drying step for the zucchini shreds. I haven’t made these yet, but when I do I’ll give that a try and follow up with another comment. Absolutely! The degree to which the shreds are dried will change the outcome. Love to hear how they turned out. I’m sorry, but these are horrible. I feel like I wasted my time, effort and the ingredients. Sorry, but I give them a -2 stars. I’m so sorry they didn’t work out for you. I’d be happy to make suggestions if you provide some details. Awesome in the waffle maker! Skip the raisins though.. Waffle maker doesn’t close as well. Thanks for sharing! Can’t wait to try it next time I have my waffle maker out! Was looking forward to making these and I tried twice with the same results. Both batches came out way too gooey inside. I tried cooking them longer and nothing seems to help. Made one following your directions and made the next without drying the zucchini. Haven’t had these results with other recipes, but not sure why they didn’t cook through. I’m so sorry they did not work out. It’s very hard to diagnose what might have gone wrong when it comes to baking muffins. 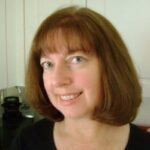 I did find this article that may be helpful http://www.mrbreakfast.com/article.asp?articleid=28 . Thanks goodness I find the website that I can follow the healthy Ideas of muffin making. Cant wait to make your zucchini Muffin. Just made these for brunch & very disappointed. I wondered about the amount of flour — really did not cook up to be like baked goods. The softness of the zucchini made a not-quite-cooked sort of feeling for the muffin body, even though they were well-cooked (an extra 5 minutes & still didn’t improve. I’m so sorry that these did not come out for you. I wonder if the zucchini was too wet?! I made these and my daughter loved them, my sons loved them, Mommy ate 3 right out of the oven, even the nanny LOVED them. I doubled the recipe and sprinkled flaxseeds on top! So good and I loved that they didn’t have as much sugar in them! Placing this recipe in our “go to recipe” Pinterest Board.